Bodog.com - Review of Poker, Sports & Casino - Is It Legit? Bodog's online poker, casino, sports, and racing platform is one of the leading gambling sites on the PaiWangLuo Network. The current ownership structure of the Bodog empire is a bit confusing, but suffice it to say that it's descended from the successful gaming destination founded by billionaire Calvin Ayre in the 1990s. Bodog's Canadian division is housed at Bodog.eu and holds a license from the Antigua Gaming Commission. The Latin American version of the site is called Bodog.com, and it's licensed in Curaçao. Bodog has recently expanded into the Indian subcontinent with its Bodog.com/in domain, which also has licensure in Curaçao. There are various small differences between the three sites, which we have noted below where appropriate. All the poker gameplay is identical at all three rooms, and they share cardroom traffic with each other and several other partner organizations. The major aspects that vary between these sites are the promotions, cashier functions, and some of the casino gaming options. Bodog has really improved its poker operations over the past few years to become the seventh-largest online poker destination worldwide. It has achieved this level of success not by copying what others have done but rather by sticking to its own idea of what an online poker room should be. The philosophy here is called the “recreational player model,” and the basic gist of it is that the site aims to attract casual and novice players instead of catering to experienced pros. If you're a pro yourself, then you might have a few second thoughts about this mindset, but the truth is that this strategy has succeeded beyond all expectations, leading to butter-soft games. What you lose in the lack of Bodog rakeback and other perks is more than compensated for by the quality of the opposition you'll face. The poker bonus at Bodog is a 100% up to $1,000 match, which will be applied automatically on your first deposit without the need for a Bodog Poker bonus code though you may have to select the deal from a drop-down menu when making your initial deposit in order for it to be applied to your account. 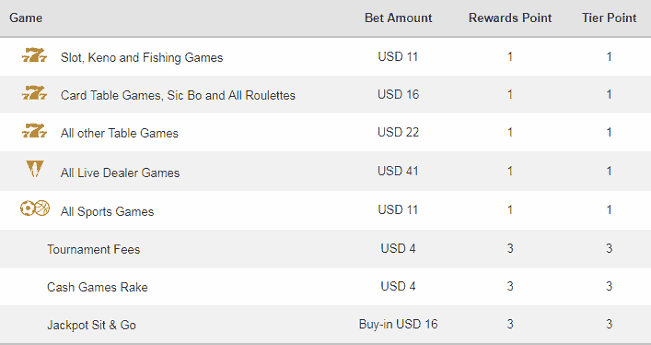 Unfortunately, the Bodog poker bonus is not active on Bodog India. Only Latin American and Canadian customers have access to the Bodog welcome bonus at this time. The amount of bonus you earn is tied to the amount of Reward Points you accumulate during the 30 days after you first fund your account. Every time you collect another 150 points (Canadians) or 15 points (Latin Americans), you'll obtain a $5 bonus payment, which will be applied to your balance as real money. The rate of point accrual is different at Bodog.eu (CAN) and Bodog.com (LATAM). Canadians will receive 15 points for every $1 paid in tournament and SNG fees, 15 per dollar contributed in rake in cash games, and 1.5 times the buyin amount of Jackpot Sit & Gos in points. Users in Central and South America instead get 3 points for every $4 paid in tournament and SNG fees, 3 for every $4 contributed in cash game rake, and 3 points for every $16 in Jackpot Sit & Go buyins. Tournaments, SNGs, and ring games clear the Bodog.eu poker bonus at the same rate: a rakeback percentage of 50% because you must pay $10 in rake to get back $5 in bonus. In Jackpots, you'll actually do considerably better, increasing the cashback percentage to an incredible 71%! The Bodog.com poker bonus unlocking rates are identical in cash games, sit n' gos, and MTTs. To collect 15 points and redeem $5 of the bonus, you have to pay $20 in rake and/or fees, for a 25% rakeback percentage. Because of the fact that points are calculated differently in Jackpot Sit & Go, this format boasts a superior rate of return: approximately 89% cashback! Bodog.com lets players denominate their accounts in currencies other than U.S. dollars. In case you're using a different currency, the total value of the poker bonus will be capped at a figure corresponding to about $1,000 U.S. dollars, which is 4,000 Brazilian reals, 20,000 Mexican pesos, 40,000 Argentine pesos, 3,000 Peruvian sols, or 7,000 Bolivian bolivianos. Bodog.eu accepts poker, sports, and casino players from Canada while Bodog.com transacts in Mexico, Brasil, Argentina, Peru, Bolivia, Venezuela, and Chile. Bodog India does business in India, Bangladesh, Sri Lanka, and Nepal. Nevertheless, you can join whichever of these three sites is appropriate for your location right from this page. If you're ready to take the plunge, then sign up right now. Otherwise, continue reading our reviews of the online poker room, sportsbook, racebook, and casino at Bodog. Click on this Bodog.eu direct link! Click on this Bodog.com direct link! Click on this Bodog India direct link! Step 6: Contact Us with your "customer ID number" and registered email address so that we can confirm your account. Players can get their "customer ID number" by emailing support or phoning them toll-free. Step 7: Deposit and enjoy! You can deposit with a credit card for free. However, Professional Rakeback recommends that all players transact using Bitcoin for access to large and fast payouts. If you think it's a hassle to learn how to use Bitcoin, think again! Check out our Bitcoin gambling guide for step-by-step help, with screenshots, on setting up your BTC wallets. HUD: Do you want to use a HUD when playing? Sadly, the terms and conditions of Bodog are restrictive, and very few HUD programs are allowed. In fact, only one appears to natively support Bodog. 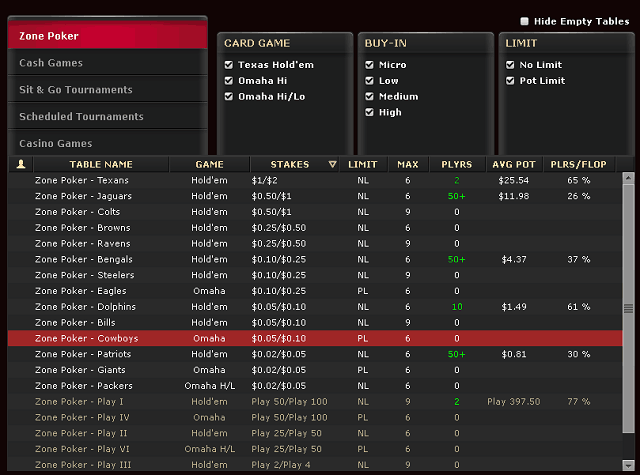 That program is Holdem Indicator, and it even works in Zone Poker games. Professional Rakeback offers an exclusive 10% discount on Holdem Indicator (and iHoldem Indicator for you Mac users) to our visitors. If you're interested, head over to our software page. If you want to buy it now, with a ten percent discount off the retail price of $99 USD, then click here for PC and here for Mac. There's actually another HUD solution that now works on Bodog as well. You see, the developers of PokerTracker have created a free hand grabber that, in conjunction with the main PT4 program, is able to import hand histories from the site. To read more about the features of this piece of software, browse over to our PokerTracker 4 review. To purchase it today, click this link. 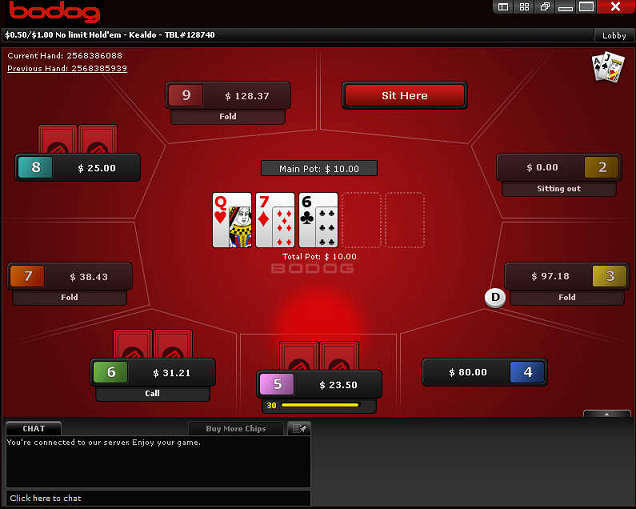 The heart of the recreational player model at Bodog Poker lies in anonymous gameplay. No user is identified by any name other than a randomly generated player number. Not only is it impossible to track your adversaries over long periods of time, but you can't write saved notes on them either. There are a couple of HUD tracking software programs that work with Bodog, but they only allow you to monitor your opponents over the course of a single table session vastly reducing the utility of these types of tools. In the two most popular forms of cash game poker, No Limit Hold'em and Pot Limit Omaha, stakes run from $0.02/$0.05 to $10/$20. There are also LHE tables denominated from $0.05/$0.10 to $30/$60 and LO8 running from $0.25/$0.50 to $30/$60. You can only join a maximum of four ring game tables at a time. In April 2017, Bodog introduced a Quick Seat feature that makes table selection impossible. The way it works is that players select the game format, table size, and stakes they wish to play, and then the software places them in a seat at an appropriate game. The consequences of this change have been that the most demanded games tend to fill up more rapidly than before, but thinly played variants, like the limit tables, have seen a drop in traffic. 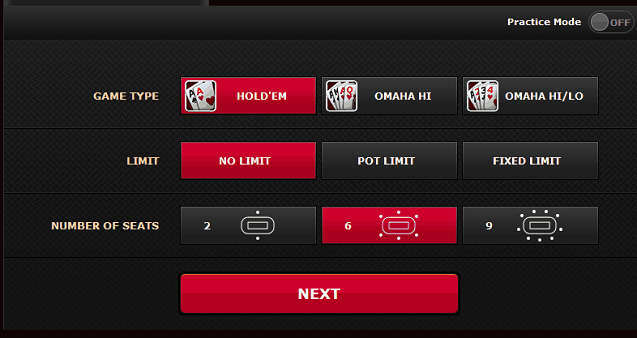 Zone is Bodog's take on fast-fold poker, a style first made popular by Full Tilt's RUSH Poker quite a few years ago. In Zone, nobody has to wait for hands to complete after he or she folds; instead, anyone who mucks a hand is brought right away to a new table to begin another round. The elimination of much of the downtime traditionally inherent in poker leads to a blazing-fast pace and ensures that you'll see many more hands per hour in Zone than at a standard ring table. Because there are no static tables in Zone, players instead join pools. You can see how many players are in each pool in the lobby although all population figures of 50 or more are indicated as “50+.” It's not uncommon, particularly during peak hours, to see multiple blind levels sporting 50+ participants at once. Although the greatest number of players can be found in NLHE Zone, PLO runs too, and there are a couple of PLO/8 stakes supported as well. Player volume in four-card Zone is lighter than in Hold'em. The buyins for SNG poker extend from $1 + $0.05 up through $200 + $14. Regular, turbo, and hyper turbo speeds are present, and table sizes include heads-up, six-max, and nine-player. There are also 27-man multi-table sit-n-goes. The majority of contests are for NLHE, but there are PLO and PLO/8 games listed up to $100 + $9. Bodog offers Double-Ups, which are similar to the Double or Nothings you may encounter at other sites, as well as Triple-Ups, which pay out three buyins apiece to the top third of the participants. Most of the Double-Ups charge half rake compared to similarly priced competitions, but this isn't the case with Triple-Ups except at the higher buyin levels. Beginner matches have a flatter payout structure than the other games, allowing more people to get paid. You can't view sit-n-goes that have already started (except, of course, for the ones that you're in), nor can you even see them in the lobby. Still, as long as you play for micro and small stakes, you should have no trouble getting the amount of action you crave. 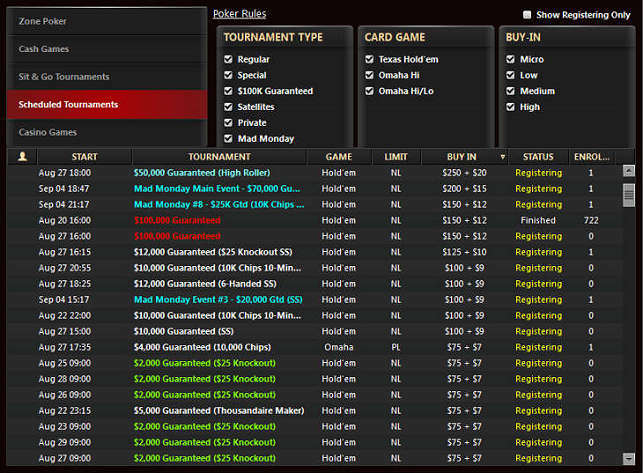 Bodog, in past years, ran frequent guaranteed tournaments that overlaid very often. This foresighted decision worked out well as the room now has enough MTT traffic to almost always cover the sums promised. There's more than $1.5 million in guarantees up for grabs each week, and the largest of them is the $150 + $12 $100,000 Guaranteed on Sunday afternoons. Throughout the rest of the week, you can buy into events priced from $1 + $0.10 to $300 + $25. Beyond the regularly scheduled tourneys, Bodog hosts series several times per year. These generally have boosted prize pools and an enhanced roster of events that allows you to play formats that are not commonly spread during the normal course of things. Recurring series at Bodog include the Black Diamond Poker Open and the Golden Spade Poker Open, each of which routinely offer millions of dollars in total prizes to the victors. Whenever these series are about to begin, satellites appear so that cash-strapped individuals can attempt to win their entries for less. The latest expansion to the Bodog poker palette, Jackpot Sit & Go, went live at the end of October 2017. These three-handed hyper turbo games use a random number to determine the prize pool. The valid multipliers are: 2x, 5x, 15x, 120x, 240x, 1,200x. The higher multipliers are rarer than the cheaper ones; the 2x option is chosen close to 75% of the time. At the top three multiplier levels, all players win with a prize distribution of 80/10/10, but the rest of the Jackpot Sit & Gos are winner-takes-all. It's possible to play up to four Jackpots at the same time. The buyins offered are $2, $7, $15, $30, $60.. Points Exchange: The points you garner while playing at the tables can be traded in for poker tournament tickets (including Jackpot Sit & Go) and bonuses to use in the sportsbook and casino. Watch for tickets to major tournament series events because they tend to represent a better value for your points than the standard exchange options. Not available on Bodog India at present. The Bodog poker software has been refined continuously for more than a decade, and it's now a very polished suite. Zone Poker, Jackpot Sit & Go, and anonymized games are just a few of the elements that developers have added after careful thought. With the capacity to be enjoyed from desktops, laptops, and mobile systems, Bodog is a fine solution for anyone in search of a poker home. A 100% up to $1,000 bonus awaits (not on Bodog India sadly) to give you an opportunity to enhance your profitability. Bodog offers its clients a standard menu of cashier methods, which we have outlined below. There are sometimes extra payment channels that are provided to certain customers, so you might have additional alternatives to choose from. Bodog accepts four different payment processors for your deposits. You can either pay with the usual suspects in Visa or MasterCard, Bitcoin using a compatible wallet (Bodog recommends Bread, Mycelium and Electrum), Bitcoin Cash, or Interac e-Transfer (Canada only). Each option has its own pros and cons which you should weigh individually. Be aware that additional methods may be offered in select geographic areas. Your Visa and MasterCard transactions may need to be cleared for international merchants as Bodog has used processors from a few different regions like India and Hong Kong. If you are not sure if your account is restricted, contact your bank and find out. Of course you must also keep in mind you may incur other banking fees, which, while not generated by Bodog, must still be added to the deposit. Fees, such as those charged by banks when a deposit is categorized as a cash advance, are not under Bodog's control. International service fees are also a concern. If your bank charges such a fee, it might be upwards of 3%. Bitcoin (BTC) is the choice that we advise you to employ especially given the current focus among gamblers toward privacy and security. Bitcoin maximum deposit limits tend to be higher than those for credit cards. The most compelling advantages to BTC, however, are that Bodog never charges any fees for its use neither on deposits nor cashouts, and you can bypass the entire banking infrastructure and its sometimes-unpredictable surcharges. You'll only have to pay the miners fees of the Bitcoin network itself, which are usually under $1. Interact e-Transfer is a way for Canadians to make deposits through their checking or savings accounts at their financial institutions. The maximum amount that can be transferred this way is $1,000, and the process takes between 3 and 20 hours to complete. Bitcoin Cash (BCH) is a crypto-currency derived from legacy Bitcoin, but it's a distinct digital coin and should not be confused with its forebear. Bodog quietly added BCH to its deposit options sometime in October 2017. Bitcoin Cash has several advantages over its older big brother, including faster transaction speeds and fees of sometimes just a penny or two. The ease of putting money into your Bodog account is great, but depositing funds into nascent accounts has never really been a big problem for most sites and their faithful customers. Withdrawing those funds is where due diligence is required. Depending on the location where you reside, you may have a variety of legacy payment channels open to you, like checks and bank wires. Bitcoin and Bitcoin Cash are probably the best ways to request payout because they never incurs any fees from Bodog and are available to customers around the world. Of course, questions concerning liquidity and solvency are always the elephants in the room when processing withdrawals. Bodog stands on its claim that it has never missed a payout. That being said, the verbiage used when asked is murky enough; you can see the foresight on their part as they say payouts are made “on a first come, first served basis.” Yet, it's rare to find any complaints of Bodog slow-paying or no-paying any individual. Withdrawal speed is wonderfully quick, easily one of the best and most reliable in the industry. Bitcoin requests are the fastest by far with funds available in as little as an hour, taking no longer than 6 hours in most cases. Legacy withdrawal processors may take longer, up to a couple of weeks, to deliver the funds to you. You'll have to submit a government-issued identification document. Additionally, if you elected to deposit with your credit card, you'll have to send in copies of the front and back of your card and fill out a Credit Card Verification form before being able to cash out. Verification takes between 24 and 48 hours. Once you complete your account validation, you won't have to do it again in the future unless you move or your personal details change for some other reason. The Bodog.eu Canada platform and the Bodog India site employ just a single currency each (CAD and INR respectively), but Bodog.com lets you hold your balance in several distinct national currencies. Your options are: Brazilian real, Mexican peso, Argentine peso, Peruvian sol, and Bolivian boliviano. The maximum amount of bonuses and other promos varies depending on the currency your balance is denominated in so that they're roughly equivalent for people from different countries. It may be possible to deposit and withdraw to and from a currency that's not natively supported by Bodog. However, you may be hit with exchange fees. For the best results, use a payment method that's compatible with the currency displayed in your Bodog balance. Or employ crypto-currency, which Bodog never charges exchange fees on. 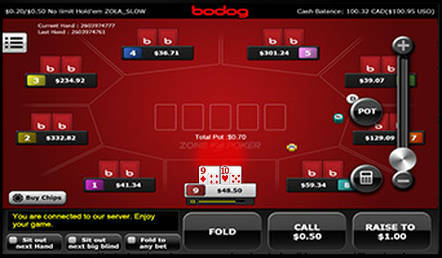 By using sophisticated responsive web techniques, Bodog is able to cater to users with virtually any type of computing hardware, including mobile devices as well as standard desktops and laptops. The only restriction is that your machine must be capable of running HTML5 software, which is a condition that virtually every system released in the past five years will comfortably fulfill. The sportsbook, racebook, casino, and poker room are all present in mobile form, and you don't need to do anything special because the Bodog website will automatically detect your screen size and adjust itself to accommodate your display resolution. The full range of poker, sports, racing, and casino betting products is present in mobile. Bodog offers a diverse selection of gambling choices for sports gamblers and bettors. On top of the general sports offered, such as Basketball, Baseball, Soccer, Hockey, Tennis, MMA, Golf, Boxing, Cricket, Football, Motor Racing Sports, and the Olympic games, they also offer action on E-Sports, Rugby, Darts, Snooker, Cycling, Volleyball, and Australian Rules Football. If you have particularly esoteric gambling intentions, you can even wager on the Gaelic Games, Futsal, Winter Sports, or political and entertainment prop bets. Throughout the gamut of sports offered, your action can be split up and customized any number of ways. With the exotics offered, bettors have more than one way of swinging the odds in their favor, helping to ease some of the risk at hand. Before placing any wagers, you need to be aware of Bodog's dual lines and how they are applied to each individual consumer. There are no hard-and-fast rules published by Bodog though the principle is pretty simple. 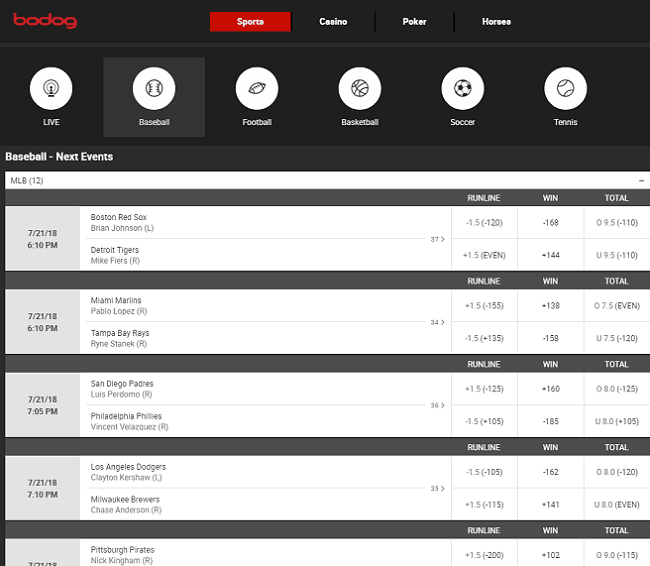 As an online sportsbook vendor, Bodog wants to see more action on big-name, popular events like Red Sox/Yankees, Barcelona, Real Madrid, and Dallas Cowboys action. Bodog will apply one of two sets of odds to each individual gambler, one for sharps and one for squares. Once you begin placing action on smaller, less-wagered matches, games or races, you may be classified as a sharp by Bodog. This is not typically a huge difference in odds: usually as little as a half point here and there on point spreads. Nevertheless, it is enough to change the bottom line. Bodog's sports welcome offer is tailored to the client base served by each of its branded operations. Look below for the deal that's valid at the network site you intend to bet at. Be aware that for the purposes of calculating your progress toward fulfilling sports bonus wagering totals, it's the lesser of your risk and win amounts that matters when talking about bets that you win. When dealing with losing wagers, it's the risk amount that counts. Bodog hands out a 100% up to $200 bonus to new sports bettors, and no Bodog Sports bonus code is needed. This deal is valid for sports, horses, and casino play; however, the wagering requirement changes a bit depending on how you deploy your bonus funds. The required rollover is 5x on the ponies or on sports while jumping to 40x in the casino. This playthrough obligation is calculated based on the sum of your deposit and bonus amount. For instance, if you deposit $200 to max out the bonus at $200, you'll have to wager ($200 + $200) * 5 = $2,000 in sports and/or races before the bonus is yours to keep. If you make your initial deposit via Bitcoin, then the maximum possible sports bonus jumps to $300. The Bodog.com sports bonus is a 100% up to $60 special with a 5x playthrough requirement on the sum of the deposit + bonus. So if you deposit $60 and get a matching $60 bonus, then you'll have to make wagers amounting to ($60 + $60) * 5 = $600 before being able to withdraw your funds. You can instead clear the sports bonus in the casino, but in this case, the rollover jumps to 40x. The Bodog India sportsbook has seen fit to give its bettors a choice of first deposit bonuses. You can opt for a 100% up to ₹15,000 match, or make do with a 50% up to ₹5,000 bonus. The first deal may appear totally superior to the second, but the drawback is that the larger bonus carries a 20x rollover requirement whereas the smaller one demands only an 8x playthrough. In either case, the amount you must wager is a multiple of both the deposit and bonus amounts added together. Bodog India allows you to claim only ONE of its casino, live dealer, and sports bonuses. Choose wisely depending on which product you're most interested in sampling. Of course, nearly every sport offered allows for straight wagers placed within their website. Outside of this mundane action, you can place a couple different types of parlays in typical multi-team formats allowing for anywhere from 2 to 12 teams to be included in a single parlay. No surprise here that all teams picked have to be winners for the parlay to hit, but that is why the parlays have higher payouts compared to a single bet. Obviously, the more teams you add to each individual parlay, the greater the payout. Now, if you are shrewd gambler and want to hedge your bets even more, you can choose to place a teaser instead of a parlay. Teasers are capped at 10 teams instead of 12, but the gambler is allowed to increase or decrease the point spread as well as altering the totals (otherwise known as an over/under bet). Now, this added benefit to the gambler does come with a tradeoff in a lower payout, but that is how most of your wagering choices work; risk versus reward tends to act as a negative reciprocal. The less risk there is in the form of bettor-influenced odds (teasers), the less the payout can be. It stands to reason that the greater the risk then, the greater the payout. Pretty straightforward. Bodog also allows for bets to be placed on individual portions of a given game, match or fixture. You can bet on either the first or the second half instead of the whole game in the NFL, NBA, or the soccer leagues offered, such as the Premier League, Spanish La Liga, German Bundesliga, Italian Series A, and the like. You can place bets on each individual quarter in the NFL, but if you want quarter action in the NBA, it is only offered during the NBA Finals. 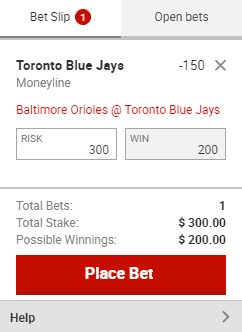 Bodog even allows partial bets on MLB games in the form of 5th Inning wagers where the bet is paid out based on the score at the end of the fifth inning provided the listed starting pitcher actually starts the game. When considering ways to hedge your bets, Bodog also allows individual gamblers to buy points within their chosen wagers. This is another option, similar to the teaser bet when picking a parlay, which allows the gambler to warp the odds in his or her favor, allowing for a better shot at a payout at the risk of a larger outlay. It would be wonderful if we could turn a 7 point favored Patriots team into a 3 point Patriots favorite. Alas, this is not the case. Bodog caps this by only allowing you to bump the line a half point and only when your final odds are a whole number (i.e., you can go from 7 1/2 to 8, but not from 8 to 8 1/2 on said Patriots game). While traditional sports-betting involved studying the lineups and placing your action in advance of the game actually starting, you're no longer hampered by this restriction. With the Live Betting platform, Bodog lets you make wagers even while matches are underway. This functionality isn't extended to all betting markets, but it is present for most of the popular selections. To browse over to this part of the sportsbook, click on “Live” at the top of the screen next to the listings of all the different sports offered..
Once you're in the Live Betting section, you'll see a list of live games along with upcoming contests to the left of your browser. In the middle of the display, you'll find all the bets listed for the match you've chosen. The lines are updated in real time as the fortunes of the competitors shift. You'll have to act quickly to make your choices before the odds change again; otherwise, the bets you intend to make will become invalid by the time you try to place them. Bodog's Sportsbook is full of options, allowing most every professional sporting event to carry action and typically in a multitude of forms. They seem to excel in the soccer leagues, covering nearly every team playing in professional soccer, offering most exotic bets, and even offering daily Bodog pick 3 team parlays on many occasions. For an online sports gambler, Bodog makes it pretty easy to cover whatever action you prefer. Bodog has partnered with some of the leading online casino game vendors, like Realtime Gaming and Rival Gaming, to bring exciting titles to its players. In all, there are more than 250 games, and you can load them up on your traditional computer or your smart device. You can try them out for free by going to the casino webpage while logged out and then log in to play for real when you're ready. The exact casino gambling lineups vary a bit among Bodog.eu, Bodog.com, and Bodog India. For instance, Bodog.com's Latin America-focused casino contains Microgaming's hit titles “Thunderstruck” and “Immortal Romance,” which are both absent from Bodog India and Bodog.eu. On the other hand, Bodog India boasts Andar Bahar, Teen Patti, Spin the Wheel, and Cricket Legend, which the other two divisions of Bodog lack. It's very probable that management has tailored the specific titles offered to the preferences of its users in each area. The willingness or unwillingness of software providers to make their products available in certain countries likely also played a role in determining the selection of games at each Bodog-branded website. There are quite a few casino bonuses for newcomers to the Bodog gaming emporium. We have descriptions of them all below, separated by site. The Bodog.com welcome special is a 100% up to $400 match on your deposit. The playthrough you must meet before the bonus funds convert into cash is 40x on both the bonus funds themselves and the qualifying deposit. Bodog allows its Indian customers their pick of one of two slot bonuses. The first is a 100% bonus up to ₹50,000 with a 25x rollover. The second is a 50% up to ₹10,000 offer that comes with only a 15x rollover. For either one of these deals, the playthrough requirement applies to the sum of the deposit amount and the bonus value. The above bonuses are intended for use ONLY with slot games. If spinning the reels doesn't appeal to you, then there's an alternate Live Dealer bonus available. Actually, the Live Dealer section of the Bodog.com/in website also gives you your choice of two bonuses. There's a 100% match up to ₹8,000 with a 35x playthrough or a 50% bonus up to ₹3,000 that must be wagered through 10x. As is the case with the slots bonus, your Live Dealer playthrough obligations must be met on the total of the bonus and the associated deposit. Bodog India has a rule that ONLY A SINGLE ONE of the slots, live dealer, and sports bonuses may be claimed by a new user. Therefore, it behooves you to familiarize yourself with all of them before carefully making your selection. This is the most well-rounded section of the casino with considerably more than 100 slots present. They vary in the number of lines, the size of the playing field, overall theme, and many other aspects. There's almost certainly something you'll like within the inventory of slot machines at Bodog. Jacks or Better, Joker Poker, and Deuces Wild are a few of the familiar names you'll encounter in the Video Poker division of the Bodog Casino. Many of the varieties can be played for up to 52 hands at the same time (not on Bodog India though), so you have as many as 52 opportunities to make a winning combination. Perhaps the most well-known casino game in the world, blackjack deserves a spot in any internet casino, and Bodog is no exception. There are several forms of blackjack, including European Blackjack, Single Deck Blackjack, and a few that have optional side bets, like Perfect Pairs. Such favorites as Roulette, Craps, and Baccarat from land-based casinos are also available on the Bodog Casino online platform. You won't have to deal with $10 or $25 minimum bets because you can put down as little as $1 per round in most of these games. This is a catchall class that contains amusements that don't fit in anywhere else, like scratch cards, keno, and bingo. If you're looking for something a bit unusual and distinct, then here's where you ought to look. Within the Live Dealer area of the Bodog Casino, you can enjoy games operated by a real-life dealer. Blackjack, Early Payout Blackjack, American and European Roulette, Baccarat, and Super 6 are all available for you to play. Bodog doesn't just expect you to know how every game works. For each gaming option, you can view a lengthy text about how the game functions to the left of the window while the game itself occupies the remainder of the width. Here, you'll see a description of the game, how the payouts are determined, any variables that come into play, and more. 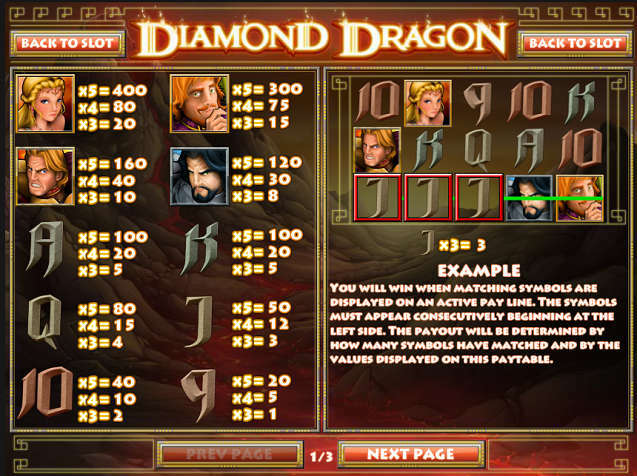 Even from within the games themselves, you can usually press an icon labeled “Rules,” “Pay Table,” or something similar to view material related to the gameplay possibilities and the winning combinations you must try to achieve. The newest innovation to appear at Bodog.eu is casino leaderboards. These are short contests for specific games with scheduled beginning and end times. These leaderboards see players accrue points with each hand or spin, and more points are given for bigger wins. At the end of the competition, the top few (usually three) performers walk away with a bonus. All gameplay in Bodog casino leaderboards uses real money, so you'll bank your wins and losses like normal in addition to the prizes granted. The bonuses you can win in these leaderboards tend to be on the smaller side, no more than $20, but they carry an easy rollover requirement of only 5x. We've done the research to figure out how valuable these leaderboards can be, and we found them to represent a great way of scoring some free money. Watch our video of Ignition Casino leaderboards to learn more. (Ignition is one of the partners of Bodog, and their leaderboard setups are fairly similar). As of March 17, 2019, leaderboards are featured at the Bodog.eu Canadian casino, but they cannot be found on Bodog India or the Bodog.com Latin American site. We've been assured by our contacts within these organizations, however, that it's only a matter of time before this element is added to the two sites. Bodog's diverse casino gambling lineup means that you don't have to restrict yourself to just one or two styles of betting but can instead relish a wide array of casino fun. The first deposit bonus will increase your chances of walking away a winner. The Bodog Racebook offers a variety of options to the casual and semi-professional gambler who is looking for some reliable action on his or her handicapping. Operating without much difference between Bodog Online and a brick and mortar track, there isn't much action that Bodog won't book. From pari-mutuel pool wagers on nearly every race to fixed-odds action on the large stakes and derby races to futures, props, and boxed and wheel action, Bodog offers a buffet of racebook choices. As far as the bonuses go, horses has the same bonuses available as sports, and all the terms and conditions are identical. Bodog allows you to begin wagering on thoroughbreds, quarterhorses, and harness racing, your choice. Harness racing is quite overshadowed but available regularly, comprising no more than 20% of the overall race coverage. Of course, most of your daily tracks and races will be available in the form of pari-mutuel pool bets where the total payout is divided amongst those who have winning tickets. Obviously, this means the key to a successful day of wagering is not so much picking a winning horse but picking one whom few others choose. The smaller the pool of winners, the larger the payout is. Although the morning line is shown to the right of the horse numbers, these are not the odds that Bodog pays out by any means, and they are simply provided for informational purposes. Fixed-odds wagering markets and futures are offered by Bodog on Saturday mornings. Bodog only offers fixed odds on major stakes races, maybe half a dozen races per year. You can typically expect to see fixed odds on The Kentucky Derby, The Preakness Stakes, The Belmont Stakes, The Breeder's Cup, and The Dubai World Cup. There you will see a maximum payout of $50,000 USD with straight stakes maximums of $1,000 and $500 on exotic wagers. Each tier of tracks has lower maxes with Category A tracks allowing a $30,000 maximum payout, with $500 straight and $300 exotic limits. This tier includes Aqueduct, Del Mar, Oaklawn Park, Arlington Park, Gulfstream, Santa Anita, Belmont, Keeneland, Saratoga, Churchill Downs, and Meadowlands Thoroughbred. These tracks and subsequent levels represent the daily tracks where you can expect to find pari-mutuel betting only. Category B allows a $15,000 USD maximum payout with straights and exotics accepting maximums of $500 and $200 respectively. Tracks in this tier are Calder, Monmouth, Turf Paradise, Fair Grounds, Mountaineer Park, Turfway, Golden Gate Fields, Pimlico, Hawthorne, and Santa Rosa. The last two categories are the most numerous in number with the lion's share belonging to Category D and others encompassed in Category C. The 12 tracks in C permit the bettor to risk $300 on straight wagers and $150 on exotics with the highest possible payout of $10,000. Category D contains dozens of venues with $200 allowed on straight bets and $100 on exotics. The max winning payday for Category D is $5,000. British tracks are covered as well as Ireland. They're all included in categories C and D. A handful of racing tracks from South Africa are also listed, and all of them are Category D facilities. All in all, Bodog services bettors with racebook options on more than 180 different tracks. There are tracks that you may want action on that Bodog does not offer, but those are few and far between. You will be hard pressed to find a gambler who cannot make the picks he wants due to a lack of track selection. 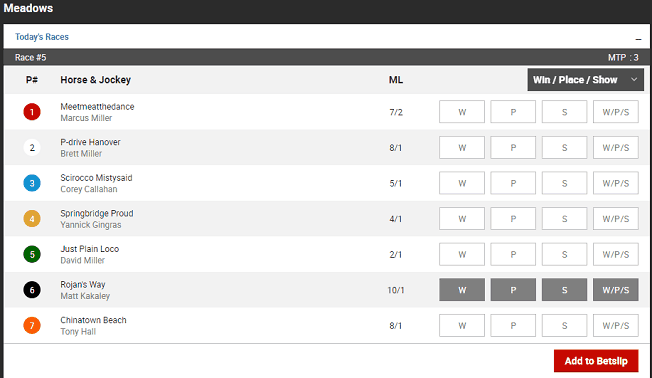 All bets offered by the individual tracks are mirrored by Bodog as well. Essentially, if you cannot make the bet at Bodog, you cannot make the bet at all as the track isn't offering it. The Bodog Rewards/VIP program is intended to reward the firm's frequent customers. It used to have one disadvantage, which was that playing poker didn't advance your position in Bodog Rewards, and neither did it grant any of the benefits of the system. However, circumstances changed in February 2019 when Bodog added poker to this program. 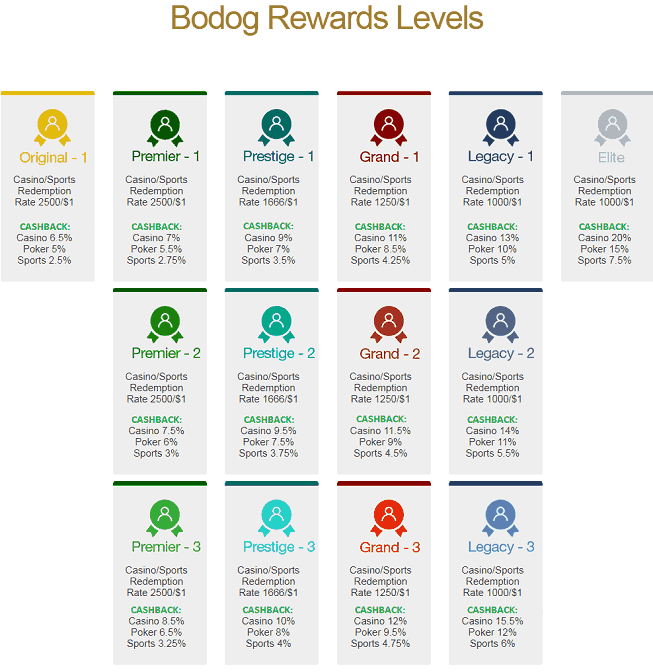 The details of this loyalty system are distinct at Bodog.eu and Bodog.com. Meanwhile, Bodog India doesn't yet have a member rewards club. Under the terms of the Bodog Rewards plan, Canadian customers get a specified number of reward points for every dollar risked in compatible products. Video poker and table games only give you 1 single point per dollar, but slot machines are worth 5 and specialty casino games give you 15. Sports bets are worth between 3 and 25 points for every dollar wagered with the higher figure reserved for round robins and parlays. Racebook straight wagers grant 40 points per dollar while exotics are valued at 60/$1. For your poker play, you'll receive 15 points per dollar paid in rake and tournament fees. In Jackpot Sit & Go, the rate of point accrual is 1.5 points per dollar paid in buyins. These points determine your rank in Bodog Rewards, and once you reach a tier, you can never drop back down in status. While the extras delivered by Bodog Rewards can be quite remunerative, the organization feels that they're not enough for its most serious customers. Enter the 94 Club – an exclusive VIP section that can be accessed by invitation only. If you're lucky enough to be inducted into this hallowed realm, then you can look forward to waived deposit and withdrawal fees, personalized customer service, extra promotions, a higher rate of point accrual, and even tickets to major events like the Superbowl. Customers from South and Central America will progress in the Bodog VIP Club with all of their sports, casino, and poker gaming. For each bet made or game played, they'll collect points according to the schedule below. The amount of points earned will determine your position in the program. Each tier can convert Reward Points at a rate that gets better the further one advances up the levels. These bonuses can be cleared in the Casino and Live Dealer sections with a 40x rollover or in the sportsbook with a 5x playthrough. There are other benefits in store for those who climb the ranks. For example, starting at Black level, bettors get one free wager per month, and beginning at Prime, customers receive invitations to exclusive VIP events. It's possible to drop down to a lower status in the Bodog VIP Club. At the beginning of each month, everyone loses 16% of their accumulated Tier Points. This may suffice to result in a reduction in rank, so keep playing regularly to retain your position. Bodog maintains extensive FAQs on its websites for each type of betting offered, but sometimes, this just isn't enough. You can get in touch with customer service agents 24/7 through Live Chat or by emailing support. Canadians can also request assistance by calling toll-free 1-877-263-6422. Customers of Bodog India or Bodog.com should inquire about the number to dial to communicate by telephone. The team members at Bodog provide service in languages appropriate for the demographics of their users. This means English for Bodog.eu, Spanish and Portuguese for Bodog.com, and English, Hindi, Marathi, Gujarati, and Tamil for Bodog India. Note: The above comment actually pertains to partner site Ignition, but the security division is network-wide, so it's accurate as far as Bodog is concerned too. Do I need separate accounts for poker, casino, horses, and sports? – No, Bodog does everything with a single set of account credentials. Whenever you open up one of the gambling interfaces, your entire balance will automatically appear and be ready for you to use. Is Bodog.eu the same as Bovada? – Bodog.eu and Bovada both use the same poker platform supplied by the PaiWangLuo Network, and they also incorporate virtually identical sportsbook and casino sections. The main difference, besides their distinct bonus offers, is that Bovada allows players from the United States to sign up whereas Bodog.eu's focus is on Canada, and Bodog doesn't operate in the American market. The other major partners on the PaiWangLuo Network are Ignition Casino, which caters to Americans and Australians and doesn't have a sportsbook, Bodog.com, which serves Latin America, Bodog88, active in the continent of Asia, and Bodog India, designed for India and a few neighboring countries. Is Bodog Poker as large as PokerStars? – PokerStars is the largest destination for online poker in the world, and Bodog doesn't even come close to it in size. This really only affects heavy multi-tablers and those who play nosebleed stakes. 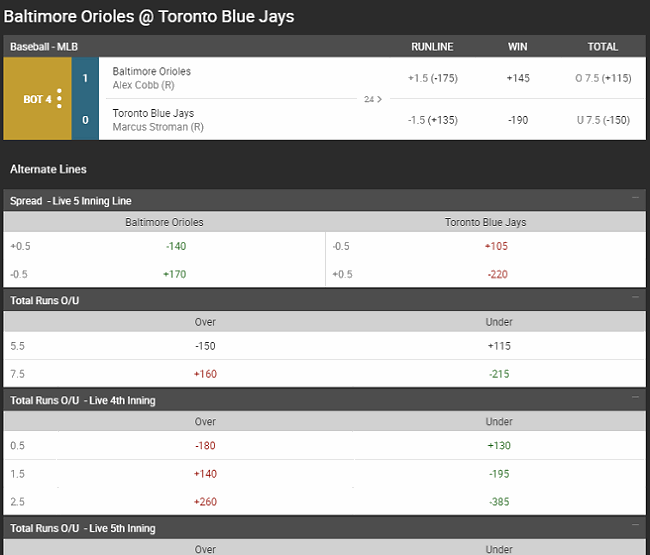 At any level of about $200NL and below, you'll be able to meet the Bodog cash game quota of four games open at once. Bodog is just a bit smaller than 888poker and PartyPoker, but its games tend to be far juicier than any of the aforementioned internet poker rooms. I just want to play poker. Can I decline the casino/sports bonuses? – Bodog fully realizes that not all of its bonuses appeal to everyone. There are a few simple steps you can take to forfeit any of your bonuses. While logged into the Bodog website, go to the My Rewards Page. Locate the bonus you wish to forfeit, and click on it. Then press the Forfeit Bonus button. If you're having trouble canceling a bonus that you don't want, you can always contact support to have them remove it manually. Be aware that not only will the bonus funds be removed from your account, but so will all winnings associated with them. To avoid any issues, we advise you to forfeit the bonuses you don't want before beginning to play with them. If my tournament ends unexpectedly, how does Bodog handle the situation? - There are established formulas in place for how Bodog deals with the prize money of any tourney that does not run to completion. Learn more about these policies with the PWL Network tournament cancellation guidelines. Permalink Submitted by HenryG (not verified) on Sun, 03/10/2019 - 08:14. I live in Canada. I tried to create an account and the website kept telling me they do not offer services to my location. I do not live in Quebec, which seems to be the only excluded area? I do live near the border though, do you think that it is some glitch? Permalink Submitted by PRB Responds on Mon, 03/11/2019 - 10:19. Given what you have told us we think that you are experiencing a glitch indeed. This is likely the result of your close proximity to the Quebec border. You see, they rely on a technology known as "geolocation" which is reasonably accurate for 99% of cases, but breaks down in close call situations such as yours. Typically, people who live within a 20 kilometer distance from a restricted area can be falsely identified location-wise as living within said restricted zone. Our advice is to call support and tell them about your problem. Offer to provide them documentation proving your location. An alternative would be to drive further away from Quebec and create your account in a location with free wifi and input your real address as normal. Once you go back home, you should be able to load the poker software just fine. Please note that security will almost certainly ask you for proof of identification and proof of address at some point (likely when you go to withdraw the first time).